Hugh over at Hugh’s Views and News is always good for a photography challenge. However, this week’s challenge happens to be for a very good cause as well. For every Christmas Tree Topper posted in blogland between now and January 5, 2016, Hugh will be donating £1 to The Dog’s Trust (to a maximum of £250). 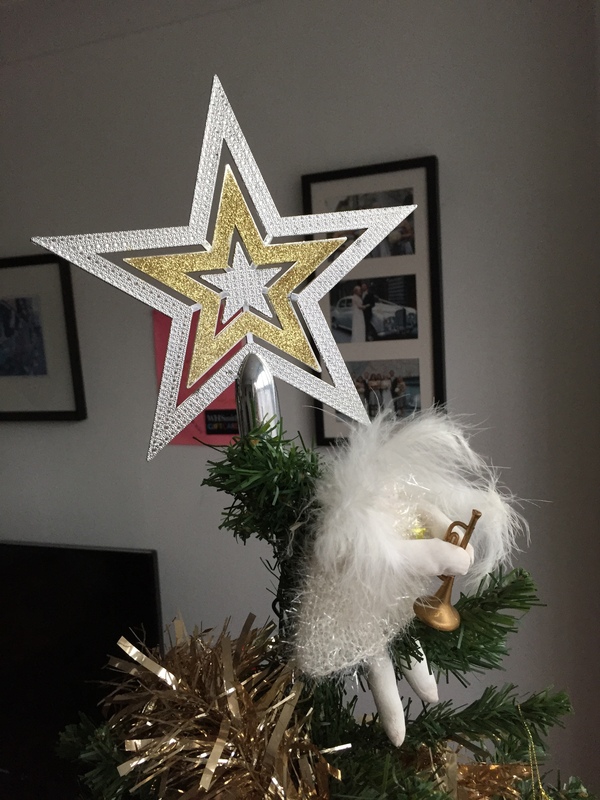 As you can see, the top of my tree features a rather glam-rock style plastic star, as well as Fluffy the Angel, who we’ve had since the gorgeous child was very small. The tree itself is about ten years old, and was a $29 special from Kmart, if I recall correctly. I refer to it as ‘the Charlie Brown tree’, because it reminds me of the Peanuts Christmas Special where the kids go to get a tree, but the only one left is small and threadbare. However, when they dress it with decorations, it looks beautiful. That’s what our tree is like as well, although this year it is shedding rather more fake pine needles than usual, making me think it might be coming to the end of its life. If you’re interested in seeing more Tree Tops, head over to Hugh’s blog. Or add one of your own! Thanks so much for joining the challenge and for helping us get a little bit closer to our target of £250 for The Dogs Trust, Helen. I must say that both your star and fluffy angel are spectacular, although I do hope you can get a few more years out of the tree. Love that glam rock retro star Helen! I hope to take part tomorrow too! What an amazing challenge Hugh has set! Mine is very plain, I’m afraid. But I do have some very special angels on my tree.